POETS’ CORNER. Between Knoxville and Blaine. Somewhere between those Tennessee burgs, Hank Williams died in the back of a taxi, at age 29, without anyone noticing, until quite a lot later; whereupon a ghoulish fight ensued over his corpse; and then over his musical legacy. Its a celebration (Poets’ Corner cf Westminster Abbey) of poets I admire viz: Hank Williams, Shelley, Keats and Byron, Rimbaud and Robert Johnson – the last perhaps the most incredibly copied and robbed poet of all time – since its widely accepted that his 29 recorded works (for which he got paid nothing) laid the foundations of much black (and then white) popular beat music and lyrics from 1930 to now. You should be able to pick up the references. Jack Wilson/Shane refers to an iconic movie scene. Wilson is the ‘bad’ gunman who is killed in a final showdown duel by Shane, the ‘good’ gunman in the movie Shane. The lead character, turned out to be the archetype and progenitor of all the The Good, The Bad and The Ugly action heroes, usually played by Clint Eastwood. These exemplify the mixed up moral compass of conventional values; since the ‘bad’ guy invariable turns out to be the good guy – and the ‘good’ i.e. respectable and upright citizen, guy, turns out to be the bad guy – killed by Clint Eastwood (the unnamed and unattached drifter who has (most often) recovered from a deeply unfair past – which in its murderous turn, is a metaphor for ethical confusion, hypocrisy and gobbledegook – of the moral climate de nos jours, dontcha know. All these poets were stigmatized as ‘bad’ in their lifetimes; yet are now regarded as secular cultural saints. Heart / of Hearts who stands up for the poor. Right through the whole world. In poems like diamonds raining down. He watched as they gambled for his clothes. (Tell ’em) I’m down in Ethiopia somewhere. Shelley’s tombstone has: COR CORDIUM = ‘Heart of Hearts’. Lost Highway is imho Hank Williams’ best complete song lyric. Arthur Rimbaud disowned his past as one of the most revolutionary and beautiful poets there have ever been; and became a wide-ranging trader/smuggler in Africa – at first in Aden and then in Harar, Ethiopia. If people asked him at that time whether he had any connection to the lost boy genius of French Symbolist poetry, feted in every literary salon and review, he would answer ” You don’t want to have anything to do with those people” – and change the subject. He went back to Marseilles at the age of 37 and died of bone cancer, leaving his older peasant farmer sister, who was looking after him at the end, a battered leather trunk containing what would now be about £15 million in bank deposits and convertible bonds. As a music scholar wrote to me recently after listening to Poets’ Corner [‘…there was a rich ferment of poetic influences and Garveyite ‘back to Africa’ politics infusing the lyrics of southern blues artists in the ’30s. …’]. I’m particularly interested in the ‘poetic influences’, in which I see the shadow if not the hand of Rimbaud. Quite apart from his close friendship with Ras Makkonen, father of Haile Sellasie, its pretty obvious that he is the poet of rebellion and the poor and deprived and black Africans and thus black Afro-Americans. That rebellion extends absolutely into the syntax of his works. Sound poetry where there was none: freeing the words, the vowels, from the chains of objectivity and formality is a very liberating idea, without having to have a particular origin or context. 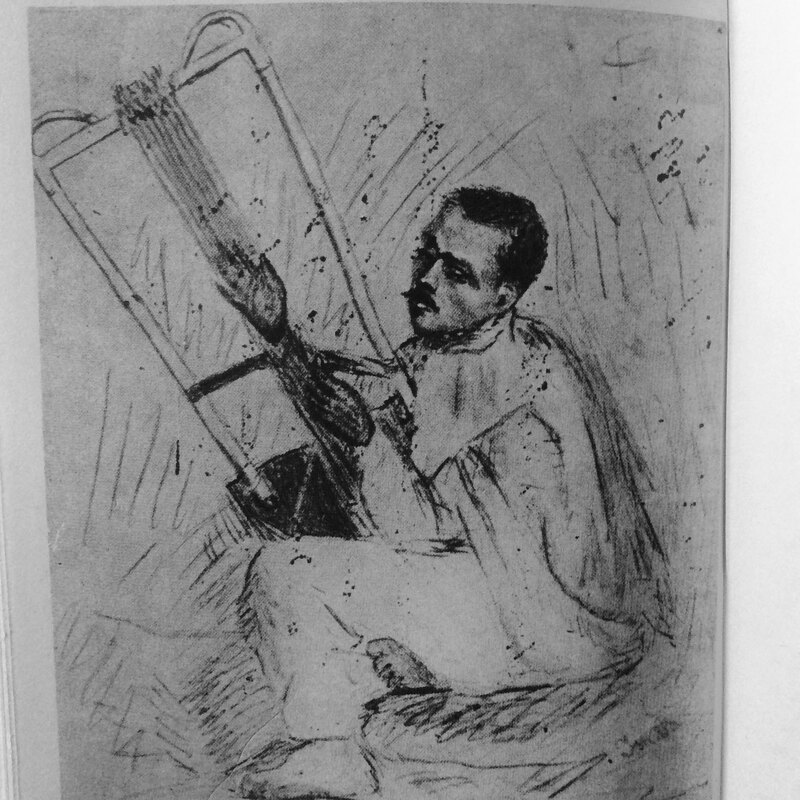 It is an amazing fact though, that Rimbaud played the Ethiopian (or ‘Abyssianian’) harp, which is a Kora-like instrument with less strings, which makes a buzzing noise. Blues – Spirituals? Get this: Its used as a semi-drone, plucked or strummed accompaniment to trance-inducing quasi- religious songs. It is an instrument to accompany singing. What was AR singing? Rimbaud had been taught music by a well-known chansonier in Paris called Cabaner, who was a prototype ‘protest’ singer – mostly out of his head on hashish and painted by Manet. Initially AR played piano; but pianos did not long survive in Ethiopia – so he took up the Harp. This whole history is vibrating with oral transmission, covert, anarchic energy. It appears to have a common origin in the liberation of words, music and political movements concerning Ethiopia, Afro-American-Caribbean cultural movement, from the late 1900’s right up to now. Rimbaud’s writing very clearly had a liberating, dynamic effect on anyone who came across it in the twenty years on either side of 1900; thanks mainly to Verlaine’s publicising. Robert Johnson was an equal genius imho, poetically – and musically. My possible theory is that although his milieu was tiny 9-shack hamlets situated in the Mississippi Delta, one of his many girlfriends was a Creole lady who perhaps knew about Rimbaud and French Symbolist poetry and its liberating use of free-association words, images, feelings. Its also possible that, 50 years after Rimbaud died and his literary reputation was already widely established, the literary influences on Robert Johnson’s lyrics, came via the Marcus Garvey, Pan Africanism movement, very strong amongst African Americans at that time. Marcus Garvey was magnetized by Ethiopia and the prospect of a black Emperor, descended from Solomon. It is an established fact that Rimbaud for the last five years of his life, was a close friend of Ras Makkonen, the father of Haile Selassie. Although they fell out later, Garvey undoubtedly had a part in the origins of Rastafarianism and the cult of Haile Selassie. JAH RASTAFARI! Lines 2, 3, 8, 9, and 10 (verses 6 and 7) are direct quotes from Robert Johnson’s lyrics – the last two resonate with the life of A. Rimbaud. This entry was posted on 17 November, 2016 in homepage and tagged arthur rimbaud, Claire Palmer, Hank Williams, Isabelle Rimbaud, Lord Byron, Martin Wilkinson, Percy Bysshe Shelley, Robert Johnson. Bookmark the permalink.